Florida Citrus Sports (FCS), the primary tenant for the newly remodeled Camping World Stadium (CWS) in Orlando Florida and the host for the Kick-Off Classic and 2018 NFL Pro Bowl, was looking to bring multimedia content to more than 300 coax wired stadium TV screens. The prior tenant had only used the TVs to display video feeds from game cameras. FCS envisioned a more sophisticated display that integrated graphics with a collection of video sources available at the stadium. Specifically FCS would like to integrate the scoreboard data, game stats, 50/50 raffle pot size, weather information, stadium alerts, concession promotions, and sponsor advertisements with video from stadium cameras, cable TV, and production trucks. Distribute this new media as two new TV channels over the in-house coax network without interfering with the existing Spectrum TV channels. West Pond provided an easy to install, remotely manageable, single unit solution that met all the client’s needs and goals. West Pond worked closely with the client to define and a state-of-the-art, informational multimedia experience that quickly attracted sponsorship and easily met their return on investment needs. The system was completed on time and continues to engage fans and generate revenue at all major FCS events. The heart of the new system consists of two FlexStream media channels; the primary would utilize video from stadium cameras, the secondary would capture the output of a cable TV box or PC displaying game statistics. Every TV in the stadium would be tuned to one of these two FlexStream media channels. At the headend, prior to distribution, the FlexStream MX-400ST would encapsulate the HD video with rich HTML5 media. The resulting composite screen is encoded into a TV channel and added to the stadium clear QAM cable TV network where it can be received by any of the 300 plus stadium TVs. The entire solution fits within a single 1RU rack space, was installed in a single visit, and the HTML5 based video wrapper is easily adapted to meet the marketing needs of each event. West Pond’s Creative Services team developed a custom video wrapper template that augments game video with scoreboard data, sponsor logos, time, temperature, and 50/50 raffle pot size. West Pond’s FlexDM remote management is continuously used by both the customer and West Pond’s support staff to access and configure the device for event preparation and monitoring. 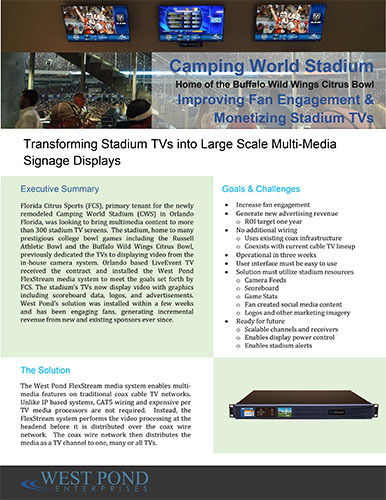 West Pond’s FlexStream MX-400ST smart headend system was seamlessly integrated with the existing Camping World Stadium coax based video infrastructure. “We are impressed with the simplicity, reliability and value of the West Pond FlexStream solution and how it enhances the fan experience here at the stadium,” – Steve Hogan, CEO of Florida Citrus Sports. Since its install in August of 2016, FCS has used the technology to increase fan engagement and generate new revenue at all major events including multiple college bowls and pro bowls. The system continues to be remotely managed by West Pond as needed.